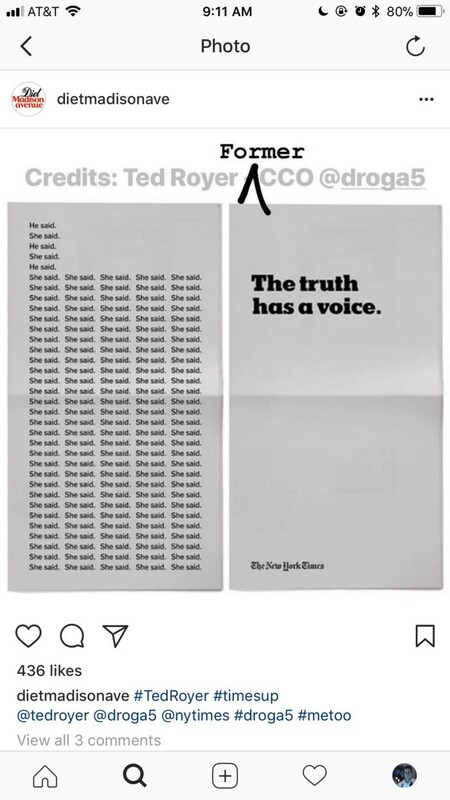 One of the few industry publications (if you can call it that) to acknowledge these rumors also happened to be the very source of them: Diet Madison Avenue (@dietmadisonave), an Instagram account that’s emerged as the leading voice for the #MeToo movement in the advertising industry. Royer is just one of several high-profile, male advertising executives fired over the past few months due to alleged sexual misconduct, and many credit Diet Madison Avenue for their firings. 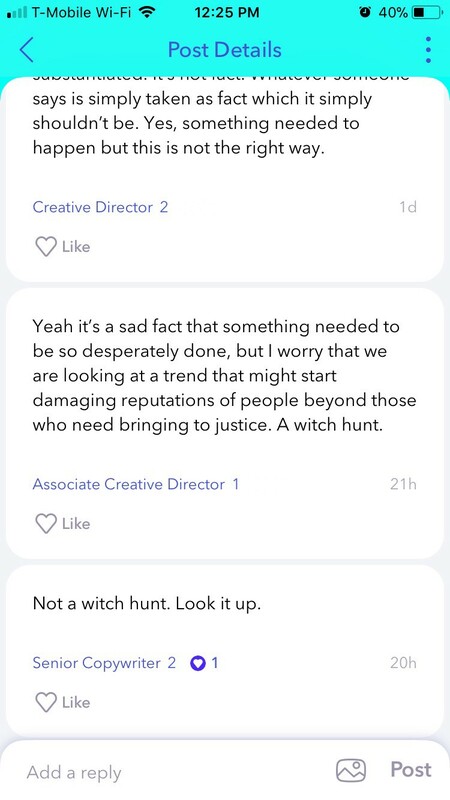 Diet Madison Avenue was created last fall, and its account reads, “Exposing sexual harassment & discrimination in ad agencies since Oct 2017, cuz HR won’t.” Its primary tactic is urging people to send direct messages about abuses they’ve suffered, or know of, in the advertising industry, and subsequently recirculating those accusations through Instagram stories. Most recently, the account asked followers to share stories about alleged misconduct at 180LA, a West Coast-based ad agency. This method has proven effective at raising awareness for sexual harassment in the industry, as the account has attracted more than 15,000 followers in just four months. But its willingness to name names has also elicited substantial criticism. For one, it’s bizarre Diet Madison Avenue is a private Instagram account considering its stated goal is exposing the truth. And its use of Instagram Stories, which disappear after a 24-hour period, to publish serious allegations of sexual misconduct raises issues of accountability. Then there’s the larger issue of trafficking in anonymous allegations of sexual misconduct — a practice many say preemptively eliminates due process and the presumption of innocence. “The kitschy branding, heavy reliance on anonymous sources, and of course, its medium of choice, Instagram Stories, makes this effort feel a lot more In Touch than the Washington Post. [There’s] an integrity and a code of ethics lacking that people need in the news now more than ever,” one anonymous ad exec told Advertising Age. The lack of clarity reflects the secrecy around Diet Madison Avenue. It’s unknown who operates the account, fueling speculation within the industry about the people behind it. On Fishbowl, a networking app where people share anonymous gossip about their respective industries, advertising employees have been guessing at the parties responsible. 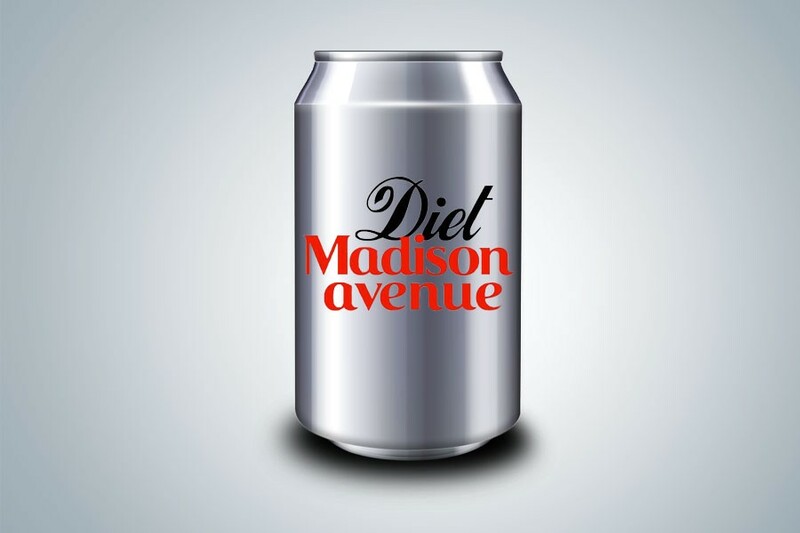 I do not run Diet Madison Avenue and I don’t know who does. Whatever its role in their dismissals, Diet Madison Avenue gleefully cheers every time a powerful, reputed abuser receives his comeuppance. And the account isnt interested in stopping its crusade anytime soon; Diet Madison Avenue is currently soliciting harassment stories about another prominent chief creative officer. And so, the Weinstein-esque reckoning it’s bringing to the advertising agency is seemingly just getting started.